As the time grows near, We wanted to answer a few questions and update some information for the day. The Ladies of the Rose have chosen to support the Wounded Warrior Project. Special tokens to commemorate the Rose Tourney will be available for a donation of $5.00 the day of the tourney. Your support of these brave men and woman will be greatly appreciated. Each Rose has been putting together her team, chosen from outside her household. Additional teams will be assembled on site from the Fighter/Fencers who are not already on a Rose team, so everyone will get a chace to play and have a good time. If you are planning to fight at the tourney, please message Mistress Lylie of Penhyll and let her know you are coming. This will allow us to get the care written and the tourney going quicker, meaning more fighting. We are Still in need of voice heralds, if you are interested in heralding during the day please contact Master Rowen Cloteworthy. In addition to the tourney there will be a Populace choice Arts and Sciences display, a Heraldic consultation table, youth fighting, and a short dance class during the day, so lots to do for everyone. EVERYONE PLEASE NOTE: The Eastern States Exposition (“The Big E”) is in full swing, which may affect hotel availability and traffic in the area. You may want to consider staying a little futher away from the site (Enfield CT to the south, Holyoke or Northamption MA to the north, for example) and leave extra time to travel. The tourney will be done in rounds. Each round will consist of 3 bouts. Each fighter will receive points for each bout. Once the round is complete, and we get all the cards back, we will pair the next round. We can fight as many rounds as the day has time for. Points are tallied at the end of each round. 4) Fighter A wins bout one the other fighter wins the 2nd and they double kill in the third bout, it will be considered a tie and each fighter will receive 5 points. 5) If there is a bye, it will be fought by a bye fighter, it will be a destructive bye, and the points will be scored as above. The paired cards are held by the Marshal (having been given to him by a list runner) and given to the combatants to return to the MoL table with the bout outcome. The fighters MUST show up at the MoL table and report their bout outcome. We tally the scores as the day processes. At the the end of the tourney we will have: A heavy list winner, a Rapier list winner, and a winning team. As is traditional at a Crown Tournament, the Ladies of the Rose who were present kept their watchful eye on the day. In court at the end of the day they presented tokens to those whose deeds of courtesy and chivalry in the list and out of it were superlative. Countess Svava Þorgeirsdóttir presented her token to Lord Erik von Hemeor. 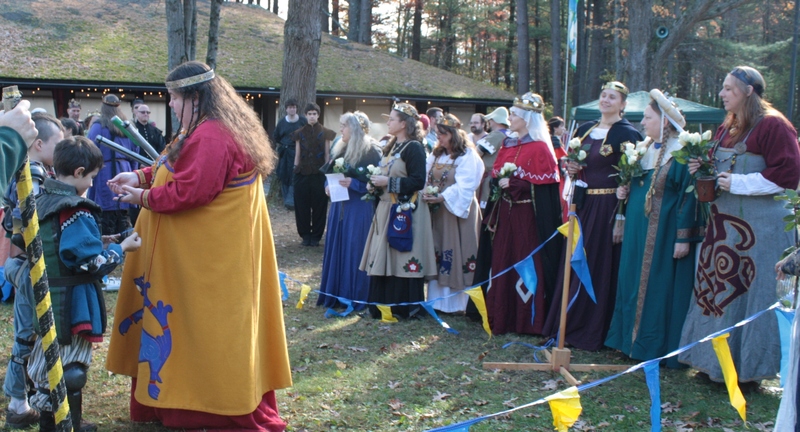 Countess Marguerite ingen Lachlainn (called Meggie) presented her token to THL Ávaldr Valbjarnarson. Countess Þóra Eiríksdóttir (called Thyra) presented her token to Lord Matthew MacGyver. Dutchess Katherine Stanhope presented her token to Baroness Leonete d’Angely for running the youth tourney. In addition, Her Majesty Avelina, in consultation with the Ladies of the Rose, bestowed the Shield of Chivalry on Lord Ionness Aurelius Serpentius. The Shield of Chivalry dates from the reign of Queen Sedalia in AS XVIII and is given to the combatant deemed most chivalrous in the Crown Tourney List.